Plenty of people manage to pack in a bit of exercise during their lunchtime, fitness classes, gym session, run, swim or just get out and have a stroll about but it’s tricky to fit in a bit of mountain biking. 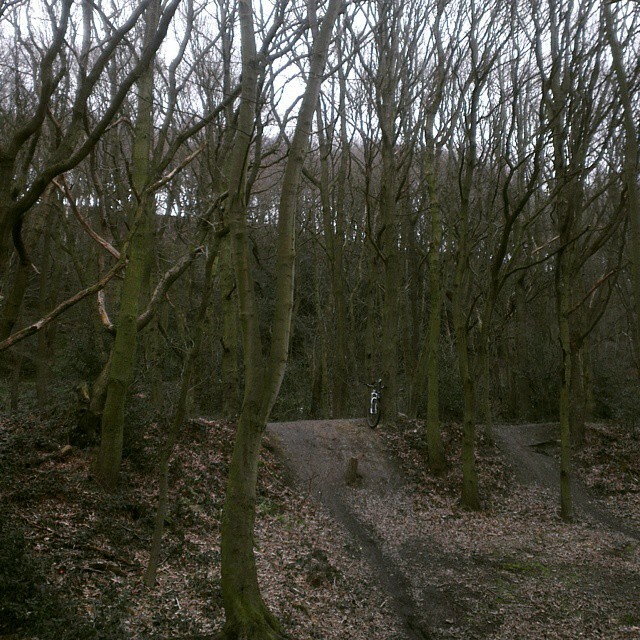 My working environment has changed to one of hot desking and home working at times and the other day I’d been out at meetings in the morning and found myself back home at lunchtime, so I grabbed the bike and headed to the woods for a blast about and a bit of practice. I feel my riding is a bit weirdy inbetweeny at the moment, I know that I have improved and am not completely useless but at the same time my mind is full of demons, no confidence and still got a lot to work on skills wise. Still that’s all part of the fun and I thoroughly enjoy the challenge of testing myself in my own small way and the search for my own personal flowy holy grail. Recently out riding with Rob he said that I was unrecognisable from where I was a year ago (I hope he meant my riding :-)) but having the good fortune to ride with him and others it gives me lots of things to watch and think about working on. One of the biggest I’ve been thinking about recently is that I’m a scaredy cat unconfident rider which translates to stiffness on the bike, knowing that you are stiff on the bike though and trying to get yourself to relax are two very different things but I’ve been thinking about hips recently. I’m more robot than Elvis so I’ve been riding with Jack Black from school of rock in my head – “Loosey Goosey Baby, Loosey Goosey” and to try and point my belly button where I want to go as when relaxed my hips will turn. There is a danger that I’m overthinking this of course but it was useful to spend an hour really trying to think and practice this approach. A couple of times I definitely got it right and then of course as things got a bit quicker I saw the tree I was heading towards, stiffened up and grabbed the brakes. Still it was a highly pleasurable way to spend an hours lunchtime and a great way to practice and enjoy my local woods (see photo at top) which are now starting to dry out so it means working from home will get a lot more fun over the summer. Of course I don’t then have to think about changing when I get back to the house, just prop the bike up grab a brew and log back in, refreshed in mind and body.